At Dunkin’ Brands, we are always looking for opportunities to make improvements to our packaging that make sense for the planet and for our business. To this end, we evaluate our packaging on an ongoing basis with suppliers and discuss opportunities to decrease the amount of material in our packaging; increase the amount of recycled and/or certified material in our packaging; and find packaging options that are recyclable, compostable, biodegradable or a combination of those. Today, 30% of our packaging is made with recycled content; 35% is compostable; and 30% is biodegradable. We also set a goal to source 80% of our packaging (from 60% today) for our Dunkin’ restaurants and Baskin-Robbins shops from Sustainable Forestry Imitative (SFI) sources by the end of 2018. In addition, our partner Keurig Green Mountain, which manufactures our Dunkin' K-Cup® pods, has publicly stated its intention of ensuring 100% of K-Cup pods are recyclable by 2020 (for more information about Keurig's journey, please see their website). 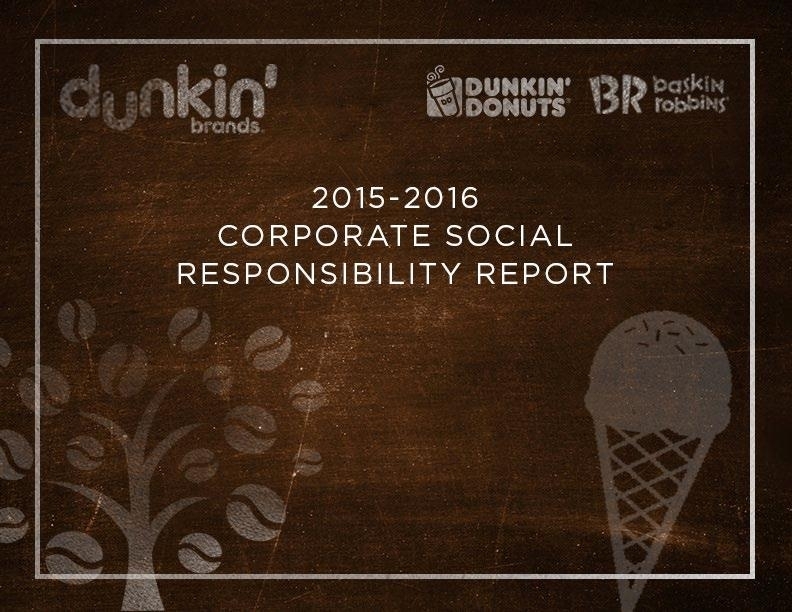 In our 2014 CSR Report, we set a goal in to identify an alternative to our Dunkin’ foam cup and stated we intended to have a plan in place by the end of 2015 to gradually transition from foam in the future. We have worked extensively to find a replacement for our foam cup that would meet three criteria: be curbside recyclable and/or be made of renewable materials; meet the performance of our current cup (keep hands cool, product hot); and not be significantly more expensive for our franchisees. While there is no perfect cup commercially available, we have determined that the best alternative, at this time, is a double walled paper cup. We will continue to work with our suppliers to produce a double walled paper cup that will satisfy local regulatory requirements, meet consumer and franchisee expectations and minimize environmental impacts. While we are not prepared to make a transition at this time, we remain committed to finding a long-term alternative to our current cup.